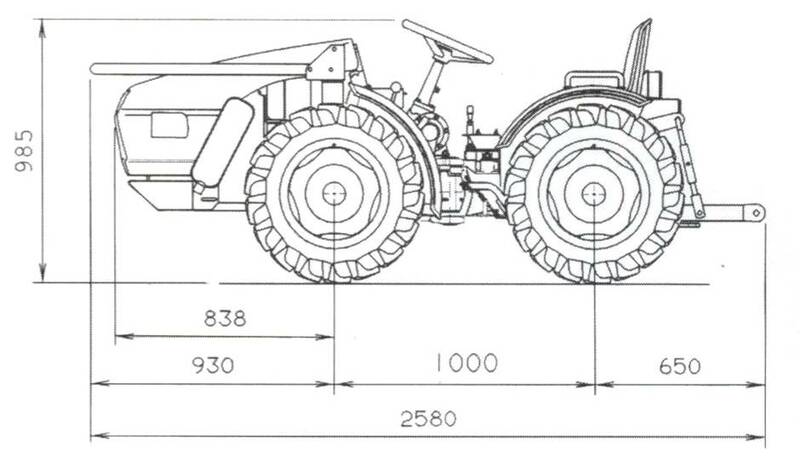 The BSG QUAD TRACTOR 20, this was designed and built by BSG here in 1997, using a Goldoni vineyard tractor chassis. The purpose was to increase safety and stability and to reduce ground pressure with the use of flotation tyres. 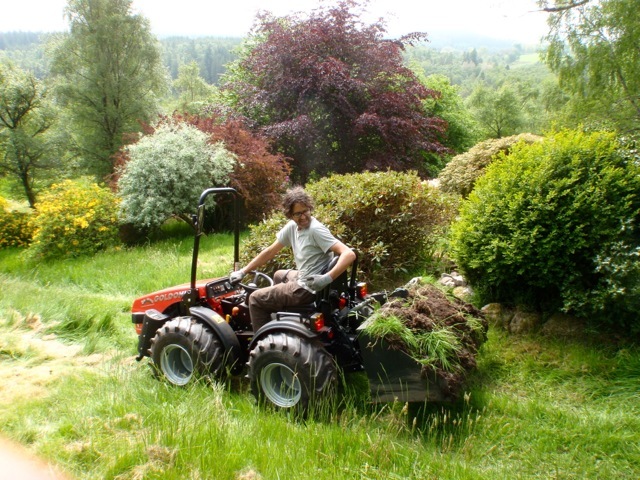 Many hundreds have now been sold and there are not many tasks that can not be performed with a BSG Quad Tractor. 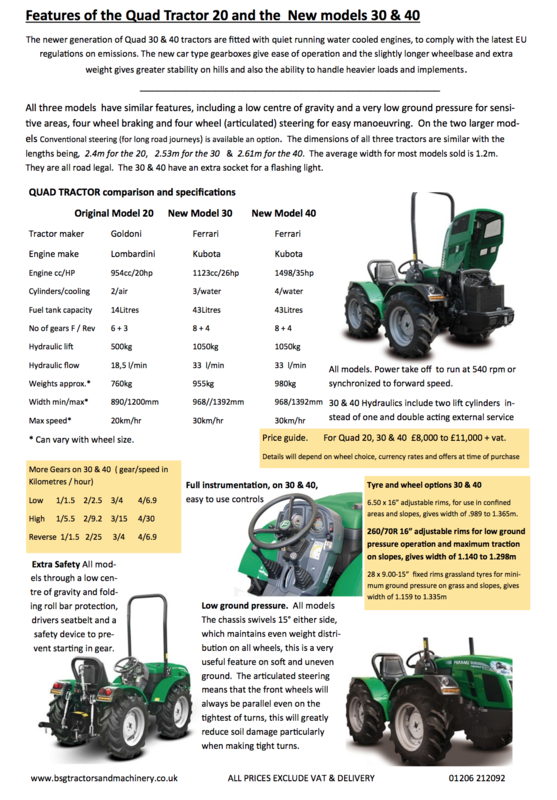 This is the only 20hp equal wheeled tractor on the market. 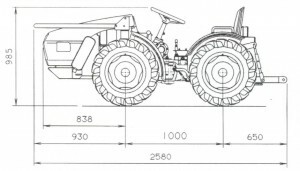 At around 15cwt or 750kg, 8ft long and up to 4ft wide, it is the smallest tractor in its class. From shifting heavy loads in tight areas to climbing steep banks or creeping over soft ground, it will outperform most conventional compact tractors. Features include 4 wheel drive, 4 wheel braking, 4 wheel steering and 2 differential locks. The hydraulic lift capacity of this model is rated at 500kg and the power take off has two speeds for economy and heavy work, as well as land drive. The tractor also has a low centre of gravity, front folding & rear safety roll bars, wide low profile tyres, forward weight distribution and a swivel chassis which allow maximum traction and stability. The articulated or four wheel steering allows the rear wheels to follow in the track of the front, minimising rutting and ground compaction. Quad Tractors have the all terrain performance of the best quad bike, the pulling power of a small crawler tractor and yet can exert less pressure on the ground than a man. Price is £7,780 for Narrow model on 6.50×15″ tyres, width from 0.87m to 1.1m (with spacers). Price is £7,990 for Standard or wide model is on 26x12x12″ flotation tyres. The width options are 1.1m or 1.22m . The wider version is the most suitable for steep terrain. Contact us for the latest offers and availability of used or ex demo tractors and equipment, when you buy a tractor from BSG you are entitled to instruction if you have not had a tractor before. There is no charge for this service. 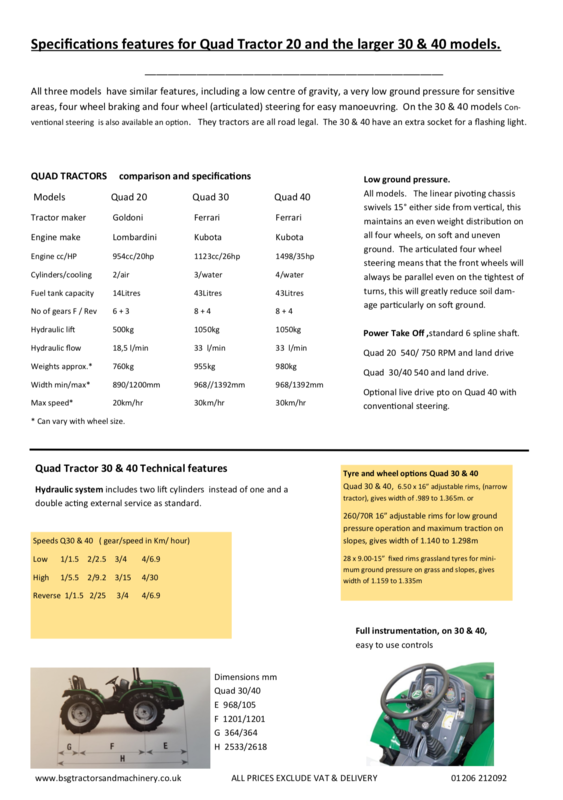 SEE SPECIFICATION SHEET for comparison between the Quad 20 and the Quad 30 & 40. The are 6 forward and 3reverse gears. Wheel sizes are 600×16″ or 26×12″ Gears km/h forward Low, 1/ 1.2, 2/ 2.5, 3/ 3.9. High, 1/ 5.6, 2/12, 3/ 18.4. Reverse 1/ 0.8, 2/1.7, 3/2.6.